I mentioned in last weekend’s post that Mercury would be entering Capricorn on 2 December, injecting our social lives with a dose of practicality and possibly some much-needed quality control. In This Week’s Tarot, warm-hearted Venus (planetary ruler of relationships) enters cool-headed Aquarius on 7 December. Universal energies encourage us to balance out the self-indulgent, feel-good vibes of this festive season with calm detachment and goodwill to everyone. And with that, here’s This Week’s Tarot! LEFT: THE MOON, REVERSED. The Moon, when upright, usually depicts deep confusion and the need to heed our intuition. When reversed, the confusion is over, but we’re still trapped in uncertainty and excuses. Dear one, the end of the year is almost upon us. If you’re reading this and hoping for your life to get better next year, but you’re not actually doing anything about it, you are enacting Einstein’s definition of insanity: doing exactly the same thing over and over again, but expecting different results. 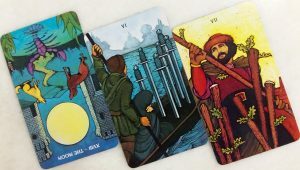 Could the Tarot be calling out some readers who are, to put it kindly, acting in a less than rational manner? Insanity, or lunacy, has long been associated with the influence of the lunar cycle. This Week’s Tarot starts with an upside-down full moon. Hmmm. MIDDLE: SIX OF SWORDS. If Einstein’s notion of nuttiness is doing the same thing and expecting different results, then his concept of sanity would be the Six of Swords – choosing to change. In this card, a young man and his mother brave choppy waters for calmer, brighter horizons. What areas in your life necessitate some form of forward movement, and breaking away from what no longer serves you? Perhaps it’s time to channel your energies into change. RIGHT: SEVEN OF RODS. This card represents self-assertion: it highlights the need for us to know who we are and what we stand for, in the face of almost inevitable opposition (because it is human nature to desire comfort and avoid change). In the Seven of Rods, a man armed with a Rod stands his ground against six unseen, similarly armed assailants. He’s outnumbered, but he won’t give up. Could this card be calling you to action? The beginning of any decision to change is scary. But choosing to stay put and wait for change to fall on your lap is even worse – it takes your birthright and power of free will away from you. Dear one, you were born to take charge of your life, to co-create your highest destiny in tandem with the Universe. Only three weeks more and then 2016 will be over. Maybe it’s time to renew some aspects of yourself to greet the New Year. Is your social circle helping or hurting you? Mercury in Capricorn suggests some tweaks to the company you keep. Stuck in toxic situations with difficult people? Maybe it’s time to move out and find your own place, have The Talk with a less-than-satisfactory partner, or fine-tune your resume. Venus in Aquarius advises us to be kind, but also to maintain the emotional calm needed to make positive changes in our lives. Live each day as if it were your first. Not your last.